The Orange Line is abuzz with delays. A train has been offloaded for mechanical difficulties at East Falls Church, and another train at Ballston appears to have begun emitting smoke. This would happen right at the peak of rush hour just when hordes of hungover Washingtonians need to be at work for Seis de Mayo. Naturally there is no notification of delays whatsoever on the website. Update: Since there has been no further buzz or WMATA update I can only assume that the delays are cleared by now. It’s just not been a good summer for Metro. Exactly a month ago, a Metro employee was killed while performing maintenance on the Orange line, and today, word comes that another Metro employee was struck by a train between Braddock Road and National Airport stations this morning. If you’re travelling on the yellow or blue lines, prepare for major delays for the rest of the day: service has been suspended between Braddock Road and National Airport. 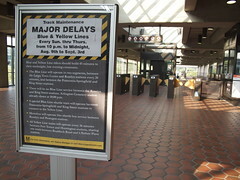 The blue and yellow lines are both split into two segments, with free shuttle bus service between King Street, Braddock Road, and National Airport stations. Update: As of 12:43 PM, normal service has resumed on the yellow and blue lines. No updates on the injured Metro employee except that he was taken to the hospital with serious injuries. Starting this Thursday, the new bridge at I-66W over the Beltway is having steel beams put in place. I-495 will see total lane closures from 9:30 pm to 5 am Monday through Thursday nights for the next two weeks. 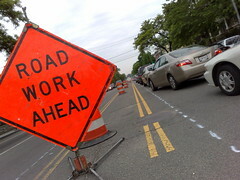 DDOT is closing a portion of the 1300 block of Park Road, NW. The section east of 14th Street will be shut to traffic from 7 am to 7 pm from today through Saturday. MDOT will be shifting traffic on New Hampshire Ave near Bonifant Road / Good Hope Road for bridge construction tomorrow and Thursday. I-270 has its share of issues, too. Resurfacing begins on a four-mile stretch between Middlebrook and Muddy Branch roads. This will force single lane closures between 9 am and 3 pm M-F and double lane closings overnights Sunday – Thursday between 7 pm and 4:30 am. According to a WMATA press release, customers on the Red Line should continue to expect slower service and more crowded trains for the next ten days. They expect the NTSB investigation of the June 22 metro crash to wrap up on July 19, after which service should return to normal. Until then, the situation on the Red Line will remain as is. In the aftermath of yesterday’s Metro crash I went with my backup plan today of skipping the Red Line in favor of the Orange. A malfunction had just occurred at Eastern Market, causing some delays, but a train arrived soon enough at Capitol South — then was held for ten minutes due to a sick passenger (photographed above). 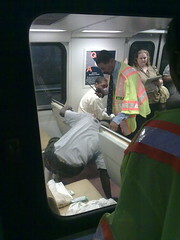 The train got moving faster than expected, however, and as it passed Metro Center I spotted yet another sick passenger being removed from another train on the New Carrolton side. Later still in the day, there was notice of more Orange Line delays due to a sick passenger on the train at Landover. Lots of sick people today. 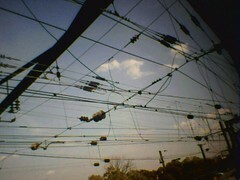 To WMATA’s credit they got trains moving faster than I expected given the all-manual mode the trains are running in. And I must give kudos to Foggy Bottom Station for having the escalators all running with relative reliability for the past week. Yay. WMATA is warning customers to expect delays on the red and blue lines this weekend due to track maintenance. Trains will be single tracking between between Van Ness-UDC and DuPont Circle stations, and between Van Dorn St and Braddock Rd stations. Delays on the red line will take place all weekend, while service on the blue line will return to normal during the evenings. Unsuck DC Metro has collected TWITTER RAAAGE from the delays. Update: From Get There blog, Orange Line problems explained. A combination of brake problems and communications dead zones led to a fifty-one minute delay on the failed Orange Line train before a Blue Line train could come within range to pick up communications. Both trains had to be offloaded before one could push the other to a rail yard. Major Red Line delays this morning thanks to a track circuit malfunction plus a train offloaded for “mechanical difficulties” at Takoma station. Rail alerts just reported “Disruption cleared” but the Twitter feedback is rolling in. 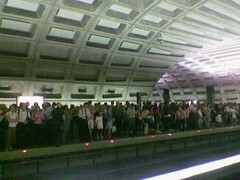 Thank you, Metro, for another morning rush hour of long waits and crowded trains. 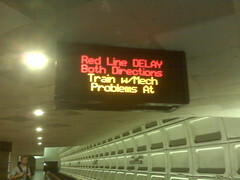 Current Metro alert says Disruption at Shady Grove in both directions. Expect delays in both directions due to the report of a person struck by a train. NBC Washington says the person was struck on the inbound rails at Shady Grove at 9:50AM. WJLA reports the man was pinned under the train but survived and was taken to a local hospital. WTOP reports the man has died of his injuries; witnesses saw him jump. Via WaPo’s Get There blog, an alert for MARC Penn Line Riders: major electrical system damage near Landover has left only one of three tracks open for inbound and outbound commuter trains, so MARC’s going to be a mess. 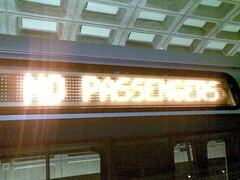 MTA MD’s official MARC alert page says Metro will honor MARC tickets to New Carrollton to get past the rail bottleneck. Baltimore-bound riders may also want to consider the Camden Line tonight, or, as a last resort, the Green Line to Greenbelt, then B30 Bus to BWI, and Light Rail from there. 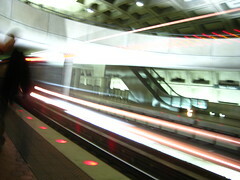 Washington Post reports that an unidentified male has fallen on to the Metro tracks at Friendship Heights Station. WJLA says he is “unresponsive” with “minor injuries,” and that he has been removed from the rails. WMATA Service Disruption alerts still have delays on the Red Line in both directions due to the incident, as well as an earlier switch malfunction problem. WTOP says Metro has turned off power to the third rail at the station and are single-tracking trains between Cleveland Park and Bethesda. Another fun Monday morning for transit, and by “fun” I mean “not fun” — and on Car Free Day too! At around 8:20 AM, a train with mechanical difficulties caused delays on the Orange Line in the direction of New Carrolton. 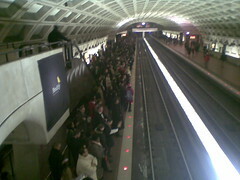 Around the same time a switch problem backed up the Shady Grove-bound Red Line. Trains were holding for 10-15 minutes (an eternity in transit terms) at stations from Farragut North upward, and platforms packed quickly with rush hour crowds. Right now a “situation that has now been resolved” (earlier, a “sick customer”) at Rosslyn has left residual delays on the Blue and Orange Lines, which are still slowed by the earlier rush hour backup. To Metro’s credit, once the switch malfunction between Farragut North and Metro Center was resolved, the Red Line got back into a smooth flow pretty quickly, and we had no problems transferring to an Orange Line train afterward. To cap it off, a friend informs me that MARC trains on the Penn Line were delayed by a conductor suffering a heart attack and needing evac at Bowie State station. Did the delays hit you on your morning Metro ride? Leave a comment. Orange Line: Trains are sharing the same track between Federal Center and Eastern Market due to a train experiencing mechanical difficulties at Eastern Market station. Expect delays in both directions. Red Line: Trains are sharing the same track between Rhode Island Avenue and Fort Totten due to police activity at Brookland station. Expect delays in both directions. Expected duration 30 minutes to 1 hour. Update: Alerts have been cleared. A small track fire on the Red Line at Metro Center prompted single tracking between Dupont Circle and Judiciary Square earlier this morning (around 7:30 AM), causing a cascade of delays down the Red Line in both directions all through the morning rush. The fire has been put out and trains are moving, but between 8:30 and 9:00 AM things were still a fair mess, with crowds of people filling trains and platforms to capacity. 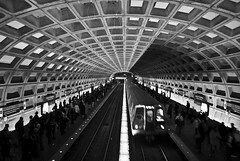 To WMATA’s credit, communication with passengers from train and station PA systems was clear and thorough, and the rush hour crowd, though thick, flowed with tolerable courtesy and smoothness. (As quickly and safely as possible, as they say.) At least, that was my experience getting to work this morning. Does anyone else caught in the crowd feel differently?